In a letter to Fr. Thomas Merton, the young Orthodox convert Eugene (later Fr. Seraphim) Rose wrote: “Above all, the Christian in the contemporary world must show his brothers that all the ‘problems of the age’ are of no consequence beside the single central ‘problem of man’: death, and its answer, Christ … Let the contemporary sophisticate prattle of the childishness of seeking ‘future rewards’ and all the rest – life after death is all that matters.” Although modern man enshrines death as supposedly natural he has no understanding of the reality of death. In the Orthodox Church alone is preserved the authentic Christian teaching on man’s paradisiacal condition, his fall and consequent death, Christ’s death-destroying Resurrection, and life after death. Unfortunately, even in the Church today there is confusion and unawareness of what the Church teaches, clouded by the notion that Orthodoxy has little to say about life after death. 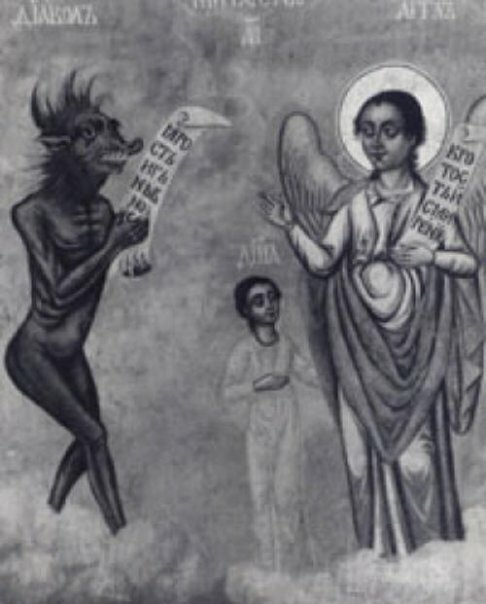 In researching the Orthodox doctrines of Heaven and Hell, angels and demons, and life after death St. Ignatius Brianchaninov found that, in fact, the Church is quite precise in what it teaches, as opposed to western teachings that become increasingly vague under the influence of philosophy and man’s growing attachment to the things of this world. It is one thing to say … that one must be careful not to read the Orthodox texts on the other world and life after death in too literal or earthly a manner, since that reality is in many obvious ways very different from earthly reality; but it is quite something else to “sweep away” all these texts and deny that they refer to anything at all in an outward way, and are nothing but “allegories” and “fables” … the Orthodox Church and faithful have always accepted these descriptions as corresponding faithfully to reality, even while making allowances for the peculiar, other-worldly nature of this reality. Upon separation from the body the soul embarks upon a purely spiritual existence which is unknown to us living in the flesh, and this is why the ascetical texts on life after death often seem strange, confusing, or even problematic to us. Only the righteous who have purified themselves and acquired a greater depth of spiritual vision have experienced a taste of such a spiritual life, and thus it is to them that we must look for guidance in understanding revelations on the soul after death. Through Patristic writings, lives of the Saints, hymnography, and even iconography, the Church provides us with no shortage of sources from which to discern the proper Orthodox understanding of the soul’s journey after death. Woe is me! How great a struggle the soul endures at its parting from the body. Woe is me! How many tears it sheds, but there is none to pity it. Turning to the angels, it supplicates in vain; stretching out its hands to men, it finds no one to help. Therefore, my beloved brethren, reflecting on the shortness of our life, let us ask Christ to give rest to the departed and to grant our souls great mercy. St. Dorotheos of Gaza further adds the truly terrifying thought that “the souls of the dead remember everything that happened here … [it] remembers the passions it gave way to and the sins it committed and the persons with whom it committed them,” and “it is alone with its own passions and, in short, it is tormented by them.” St. Ephraim of Syria teaches the same, that upon death the soul sees “all the works it performed, good and bad, by day and by night.” This is why the Fathers encourage us to remember the day of our impending death, for those who truly take up remembrance of death will never sin again. It should be noted that for the righteous, the separation of the soul from the body is not frightful, but is in fact joyful, for he has already begun to taste of the spiritual life and the soul goes to dwell in the blessedness of the light of Christ. Again, St. Ephraim teaches that “the righteous and holy, and the ascetics rejoice at the hour of death and separation … Their souls leap up, for they are prepared to go out of their bodies for their rest,” and St. Seraphim of Sarov exclaims: “What joy, what exultation await the soul when God’s Angels come to take it.” The Psalmist states: “Precious in the sight of the Lord is the death of His saints” (Psalm 115:6). But for those who have not wholly united themselves to Christ in this life the separation of the soul from the body is fearful because it is unnatural, and furthermore because at death and afterwards the soul is surrounded and attacked by horrid demons. “The death of sinners is evil,” says King David (Psalm 33:22). This reality is referred to repeatedly in our rich liturgical tradition. Every night at Small Compline the Church prays: “And at the time of my departure from this life, care for my wretched soul and drive far away from it the dark forms of evil demons,” and at the Office for the Parting of the Soul from the Body we pray: “O Refuge renowned for the sinful and contrite, make thy mercy known upon me, O Pure One, and deliver me from the hands of demons: For many dogs have compassed me about.” These are but two of the innumerable examples that could be brought forth. All who have openly rejected the Redeemer comprise the inheritance of satan: their souls, after the separation from the body, descend straight to hell. But Christians who are inclined to sin are also unworthy of being immediately translated from earthly life to blessed eternity. Justice itself demands that these inclinations to sin, these betrayals of the Redeemer should be weighed and evaluated. A judging and distinguishing are required in order to define the degree of a Christian soul’s inclination to sin, in order to define what predominates in it – eternal life or eternal death. The unhypocritical Judgment of God awaits every Christian soul after its departure from the body. Fallen angels stand guard in the expanse of the air for the testing of souls according to various sins to which the soul may have inclined during its life. These judgment places are known as the toll-houses and the guarding spirits the tax-collectors who “act thus by the right which they have acquired.” Constantine Cavarnos likewise states that this calling to account is a test of the imperfect soul by demons who reproach it with its many sins. It is important to note that the trials of the toll-houses are chiefly for those who leave this life in a tepid state, for the souls of the righteous are immediately received by holy angels, while the souls of the decidedly unrepentant are taken to Hades by the demons. Psalm 1:5 states: “Therefore the ungodly shall not stand in the judgment.” Conversely, John 5:24 teaches that he who hears and believes the word of God shall not come into judgment, and Blessed Theognostos states that the soul of the righteous man “passes through the air without hindrance, without being troubled in the least by the evil spirits.” Archimandrite Vasilios Bakogiannis concludes that “the toll-houses are for those who leave this world in a lukewarm, torpid mortal state. They are for those whose flight from this world takes place in the winter of passions or on a Sabbath (Matthew 24, 20) (i.e. without having cultivated the virtues).” Metropolitan Hierotheos Vlachos teaches the same of the souls of the righteous and the unrepentant, as does Constantine Cavarnos. The purpose here is not to offer an in-depth examination and explanation of the teaching of the toll-houses, but because the subject is so controversial in the Church in America the evidence will be weighed and certain objections addressed. It is important to note that there are only two “prominent” and vocal opponents to the traditional teaching of the toll-houses: Archbishop Lazar Puhalo, and Fr. Michael Azkoul, both of whom have histories of connections to the much troubled Holy Transfiguration Monastery in Boston of the so-called “Holy Orthodox Church of North America,” and other schismatic groups. It should also be noted that to be in schism does not necessarily negate one’s teachings (I have already approvingly quoted Abp. Chrysostomos of the “Cyprianite” Holy Synod in Resistance), but it is useful to consider the authority of who denies the existence of the toll-houses, and who affirms it. St. Justin Popović: Volume 3 of his Dogmatics of the Orthodox Church (1980) contains the toll-house teaching. Archbishop Theophan of Poltava (ROCOR): A young man who had reposed appeared to the Archbishop and asked him to pray for him to pass safely through the toll-houses, which he did. The man appeared again later to thank the Archbishop and to ask him to offer prayers of thanksgiving. Fr. Seraphim Rose: See chapters 6, 10, and Appendix III: “Answer to a Critic” in his Soul After Death. Archbishop Nathanael of Vienna and Austria (ROCOR): He conveys the traditional teaching that Christ received the soul of the Theotokos because she prayed to be spared the vision of the toll-house demons. Constantine Cavarnos: The toll-houses are taught in his The Future Life According to the Orthodox Church, pp. 23-30. Archimandrite Vasilios Bakogiannis: See his After Death pp. 59-67. Fr. Artemy Vladimirov: He relates how happening upon the Tale of St. Theodora led him to offer his first confession and a dramatic conversion to faith in Christ at the age of 18. Vladimir Moss: “The doctrine of the toll-houses, of the particular judgement [sic] of souls after death, is indeed a fearful doctrine. But it is a true and salutary and Orthodox one. Let us therefore gather this saving fear into our souls, in accordance with the word: “Remember thine end, and thou shalt never sin” (Sirach 7.36). None of these Saints, holy elders, and respected theologians has relegated the toll-house teaching, based on the testimony of many Fathers, to the realm of mere theologumena and many included them in works of dogmatic theology. No Saint or elder has publicly rejected the toll-house teaching. Abp. Lazar and Fr. Michael have focused their polemical attacks on Fr. Seraphim Rose, claiming that he has mistranslated and misinterpreted Patristic texts, but obviously Fr. Seraphim is far from alone in his interpretation; and on the 10th century life of St. Basil the New containing St. Theodora’s vision of the aerial toll-houses, but several of the authors who have written extensively on the toll-houses, including Fr. Seraphim, Met. Hierotheos Vlachos, Constantine Cavarnos, Archimandrite Vasilios Bakogiannis, and Nikolaos P. Vassiliadis, have done so without appealing to the authority of St. Theodora story which “contains nothing significant that is not to be found in other Orthodox sources on the toll-houses.” To debunk Fr. Seraphim and St. Theodora does nothing to debunk the toll-houses. Other objections to this traditional teaching of the Church are as easily answered. Against the claim that the teaching as a whole is Gnostic, Met. Hierotheos Vlachos provides the obvious answer. Acknowledging that similar ideas can be found in Gnostic texts, he notes that the teaching about the immortality of the soul, the ecstasy of man and the dispassion of the soul and body, the triparatite soul and many other things also originated outside the Church but were placed in a proper ecclesiastical atmosphere by the God-bearing Fathers. In fact, Origen in his Contra Celsium 6.22 provides and dismisses the Persian Mithraist ascent of the soul, but elsewhere, referencing John 14:30 writes that we shall encounter toll collectors who search us to find something that belongs to them at the end of our lives. Against claims that the toll-house tradition is Latin-influenced, Fr. Seraphim Rose says of the “bag of gold” with which the angels “paid the debts” of St. Theodora that it is clearly a metaphor for the prayers of the Church and critics are simply being too literal-minded. Here it is wise to recall the angel’s admonition to St. Macarius about earthly explanations of spiritual realities. Furthermore, Constantine Cavarnos writes that the deeds which are weighed refer not only to external works but moreso to the “deeds” of repentance, prayer, sobriety, and virtues in general, which aligns with St. Ignatius’ teaching that the deeds are weighed not in any juridical sense but because they demonstrate whether the soul inclines more to eternal life or eternal death. The toll-houses are also sometimes compared to Purgatory which is traditionally a third place, alongside Heaven and Hell, where a material fire causes a satisfactory and purgative suffering of souls which are bound for Heaven. Conversely however, the toll-houses are a journey and not a place of destination, through which souls may end up in either Paradise or Hades. If anything, the journey through the toll-houses would result in a soul’s placement in Purgatory, although this is of course not the Orthodox teaching. Furthermore, while Purgatory purges the soul of sin, the demons of the toll-houses seek to keep a soul entrenched in its sins. The comparison of the toll-houses with Purgatory is simply a straw-man. Critics such as Archbishop Lazar and Fr. Michael Azkoul also claim that detailed Patristic expositions of the toll-houses, such as the homilies on the departure of the soul by St. Cyril of Alexandria, St. Markarios the Great, and St. John Chrysostom are pseudepigraphal and thus lacking authority. However, even was this true the Church has deemed fit to preserve these texts under their names as if they belonged to these great luminaries. St. Cyril’s homily is even traditionally included in the Sequential Psalter. Even those who claim the works of St. Dionysius the Areopagite to be “pseudo” do not therefore question their orthodoxy. Finally it is claimed that the trials of the toll-houses make Satan equal to God in the realm of judgment. However, it must be remembered that God is always in charge, although He may sometimes use Satan and/or demons to accomplish His purposes. The most obvious example of this is the entire book of Job, in addition to Judges 9:23, 1 Kings 16:14 and 3 Kings 22:21-23 wherein God sends an evil spirit. Of those souls taken by demons Cavarnos writes: “They are not taken, though, against God’s consent and without divine concession, for God is the Lord of life and death.” Providing an interpretive context, Met. Hierotheos says that the demons are persons with free will who by permission of God and man’s allowance are able to dominate man through his passions and unrepentant heart, and that the demons have no authority over men of God. The demons only have as much power as we give them. Because so much space has been given to answering objections and those modern authorities who are trusted interpreters of the Patristic tradition, only a few Patristic and liturgical passages concerning the toll-houses will be considered here. Perhaps the earliest instance occurs in St. Justin Martyr who exhorts us to plead for protection at the end of our lives from the sword and lion’s mouth (referencing Ps. 22:20-21) from God “who is able to turn away every shameless evil angel from taking our souls.” The teaching also appears early in Origen who has already been quoted, although Clement of Alexandria already used the imagery of tolls being exacted on the passions. Perhaps the earliest full exposition is found in St. Cyril of Alexandria’s Homily on the Departure of the Soul which speaks of several different toll-houses where the soul encounters “tax officials guarding the ascent, holding and preventing the souls from ascending.”  The teaching of the toll-houses can be found in innumerable other eastern Fathers and even in the pre-schism western Church in the writings of St. Gregory the Dialogist, St. Boniface, and the Life of St. Columba of Iona. The teaching also exists in the Oriental tradition. A prayer to the Theotokos in the Eleventh Hour service of the Coptic tradition reads: “Come to my rescue, when my soul departs from my body, defeat the conspiracies of the enemy, shut the gates of hell lest they swallow my soul,” and following in the tradition of Origen, St. Anthony and St. Cyril, the Monophysite Patriarch of Alexandria, Theodosius (d. 567) writes of the Dormition of the Theotokos where he has her speak of the powers of light and darkness that seek for the departed soul and of the “merciless avengers, with diverse faces, whom God has set to teach the lawless in the way” who stand on the path whereon the departed soul will trod. The teaching is also pervasive in the Church’s universal liturgical tradition. At the 8th Ode of the Matins canon on Friday in the 4th tone we sing: “O Virgin, in the hour of my death rescue me from the hands of the demons, and the judgment, and the accusation, and the frightful testing, and the bitter toll-houses, and the fierce prince, and the eternal condemnation, O Mother of God,” and in the Theotokion of the first Kathisma hymns at Matins on the Saturday of Cheesefare week we sing: “We ever give thee thanks and magnify thee, O pure Theotokos; we venerate and praise thy childbearing, O full of grace, and we call upon thee without ceasing: Save us, merciful Virgin, in thy love; deliver us from the fearful scrutiny which we must undergo before the demons, and in the hour of our examination suffer not thy servants to be put to shame.” The universal tradition of the Church has handed to us the teaching of the soul’s journey through the aerial toll-houses. The souls of the dead … become yet more alive and more zealously cling to the glorification of God … on the basis of the testimony of Sacred Scripture … would it not be, I will not say extreme stupidity, but at least folly, to suspect even in the least that the most precious part of man (that is, the soul) … after putting off this fleshly coarseness in which it finds itself in the present life, should become unconscious …? Indeed, it would be folly to relegate the departed soul to a state of inactivity, lest we deny every appearance and intercession of the Saints. In the forty days after death this conscious and active soul embarks upon a great journey, at times beautiful and at times frightful. This journey is clearly expounded upon by St. Macarius of Alexandria who received an angelic revelation. For two days the soul is free to wander accompanied by angels. Often the soul will stay near the body and virtuous souls will visit those places where they did good deeds. On the third day when the body is brought into the Church the soul receives some relief from its Guardian Angel because of the prayers offered on his behalf in Church. Following this teaching, St. John Maximovitch states that it is on the third day that the soul passes through the toll-houses. Having successfully passed through the demonic trials, souls are brought to Heaven to do reverence before God Himself in imitation of His Resurrection, and thus the Church offers oblations on the third day. Then the soul is shown the mansions of the Saints and the beauty of Paradise during the course of six days which allows it to forget all its bodily sorrows. After this the Angel again takes the soul to do reverence to God, and thus Church offers oblations on the ninth day. From the ninth until the fortieth day the soul is shown the horrors of Hades which cause souls to groan and gnash lest it be imprisoned there. On the fortieth day the soul again reverences God and only then does the Judge determine its fitting place. Thus the Church remembers the dead on the fortieth day. Elder Cleopa teaches the same in his “The Soul’s Journey After Death.” Here it is important to note, as does Fr. Seraphim, that these numbers characterize simply a general rule – they are not dogmatic in and of themselves. Furthermore, this model in no way contradicts or negates the association of the third day memorial with Christ’s Resurrection, the ninth with the ranks of angels, and the fortieth with the period of lamentation over the Prophet Moses as is taught by the holy Apostles. And so, if by the verdict of the Righteous Judge the soul be given freedom, then immediately the enemies are put to shame, the luminous Angels seize the soul from them, and with no further obstructions it is led by the Angels to that unutterable joy and glory, to which it will finally be established. If, however, the soul lived carelessly and so was found unworthy of freedom, then it will hear that most terrifying voice: ‘Take this ungodly one away from here, that he see not the glory of the Lord’ (Isaiah 26:10). Here begins the “intermediate state” proper, when the soul will experience either a foretaste of Heaven in Paradise or a foretaste of Hell in Hades, which will last until the Dread Judgment enacted at the Lord’s return. As Cavarnos notes, many today intentionally speak of Paradise/Heaven and Hades/Hell as “states” rather than “places,” but he emphasizes that the Fathers, our hymns, and the Lord Himself refer to both destinations as places, although he clarifies that both “space” and “time” in the afterlife are not as we know them in the physical world. Fr. Seraphim, following St. John of Damascus’ teaching on the relative physicality of the soul, and St. Ignatius’ statement that “the location of paradise is in the heaven … the location of hell is in the bowels of the earth,” states that “these places and their inhabitants cannot be seen by men until their spiritual eyes are opened … Further, these places are not within the “coordinates” of our space-time system … They are not there, but in a different kind of space that begins right here but extends, as it were, in a different direction.” Vassiliadis teaches the same, but Met. Hierotheos is among those who say that these “places” are used to denote a particular way of life, although he does also refer to them as “noetic” places. However beautiful or terrifying are these experiences respectively, neither is yet the fullness of Heaven or Hell. This distinction can be difficult to understand because “Paradise” and “Heaven” and “Hades” and “Hell” are often used interchangeably in Orthodox literature, but this seems to be because they are in essence describing the same reality. Paradise is the enjoyment of God’s light in the soul and Heaven is the fullness experience by the soul reunited with the body, and Hades is the torture the soul feels by the memories of its passions, its aversion to the light of God, and the threats of the malicious demons, while Hell is the torture experienced by the soul reunited with its body. In any of these “places” the omnipresent God is of course “there” and the soul responds to His illuminating presence as it did in this life. As depicted by the soul’s forty day journey, and as taught by St. Andrew of Crete, all souls pass through Hades although the souls of the righteous do not stay there. The Saint voluntarily lays down his life that He may follow the Lord into Hades and experience yet more the wondrous mystery of the divine economy, and to know the Lord’s victory over Hades and death. Some say that there is one kingdom and one hell; but we say that there are many levels and differences and measures, both in the kingdom and in hell … God, being a just judge, gives to each a reward according to the measure of faith … For there are superior measures, and there are little measures, and in hell itself appears magicians and robbers, as well as others who have committed only little sins. Those who say that there is one kingdom and one hell, and that there are no levels, say ill.
St. Symeon of Thessalonica also says that we are obliged to believe that the souls of sinners and unbelievers are tormented by the demons according to the degree of their sins and unbelief. As the departed soul retains sight, hearing, speech, memory, feelings and other qualities it had while in the body, so the Church teaches that souls can recognize one another and remember and care for their loved ones yet on the earth. St. Macarius of Egypt teaches that the righteous are blessed to recognize and converse with one another just as men do in the market place, and that they may even come to know those whom they did not know in this life. However, this blessing is withheld from the souls of sinners because Hades is characterized by discord and the rule of hatred. The loathing that we hold for others here is multiplied a thousand times there, for as Dostoyevsky says “Hell is the ordeal of not loving anybody.” St. Athanasius also teaches that righteous souls may meet and rejoice in the expectation of their ultimate Heavenly reward. It needs no explanation that the souls of the righteous remember us – the ethos of the Church certainly includes prayer to the Saints, and to departed loves ones in private prayer, and there have been countless visitations by the Saints either through their icons and relics or “in person.” The Church teaches adamantly that death does not sever us from the one Body of Christ. Vassiliadis teaches that just as St. Peter knew supernaturally of the dishonesty of Ananias and Sapphira (Acts 3:5ff. ), so the souls in Heaven are made aware of our needs on earth through the revelation of the Holy Spirit, and Bakogiannis teaches that when a Saint appears it is not the immaterial soul itself which is seen but a form taken by the condescension of God. The appearance of a Saint may even be in truth an angel when the soul is preoccupied in prayer or is appearing elsewhere, for only God is omnipresent. When St. Andrew the Fool-for-Christ was taken to Paradise and the third Heaven he was not able to see the Most-Holy Theotokos because she was serving the suffering world at that time. According to Bakogiannis, those in Hades also remember us who labor on earth. For this he points foremost to the story of Lazarus and the Rich Man wherein the Rich Man suffering in Hades calls out to Abraham, who represents God, to send Lazarus to warn his family of the suffering that awaits them if they do not repent. He also cites the story of a pagan priest in Hades who recognizes St. Macarius of Egypt on earth praying for the souls of the damned, and says there are innumerable other such examples. However, St. Athanasius teaches that the souls of the unrepentant do not think of us because they are absorbed by the torturous memory of their sins and their coming punishment. Perhaps the story of Lazarus was an exception to the rule for educative purposes, or perhaps there is no “rule” here, but God does what is necessary in each situation. Indeed, Bakogiannis also says that it is impossible for souls in Hades to recognize those in Paradise because they do not partake of the Divine Light, but that God condescended to allow the Rich Man to see Lazarus to teach him that his punishment was just. Those in Hades are unworthy to look upon those in Paradise because they would be burned by the brightness of the glory of God within them. However, again according to Bakogiannis, those in Paradise remember their loved ones and recognize those in Hades but, according to the teaching of St. Gregory the Dialogist, because they have acquired the impassivity of God they are at peace about the justice of God. This leads to the questions of our prayer for the departed: what is accomplished thereby? Can souls in Hades repent? Can they be moved from Hades to Paradise? In essence this is the same as the question of prayer for the living – if God has His will and we pray that His will be done then of what value are our prayers? The Church teaches that after death the soul is incapable of performing works or repenting in order to find release from Hades. In Bakogiannis’ translation, Psalm 6:5 reads: “In Hades there is no repentance.” St. John of Damascus teaches that one who has departed in an unrepentant and evil life cannot be helped in any way. This is the meaning of the great chasm between Abraham’s Bosom and Hades in the story of Lazarus and the Rich Man – that there is no hope of repentance for the departed sinner. St. John of Kronstadt says that for those who are unworthy of salvation God does not move anyone to pray for them. For whom, and why, then, do we pray? The intermediate state is dynamic until the return of Christ when each receives his due reward. The righteous go from glory to glory, participating in the light of Christ ever more, but even departed sinners may receive some relief from the pains of Hades, and may even be moved to Paradise by the prayers of the Church and the mercy of God. Bakogiannis teaches that it is certain that the soul feels relief at the very moment of our prayers, while the movement to Paradise is uncertain but not impossible. Concerning relief from suffering, he also writes that after traveling through Hades the Theotokos entreated Christ to have mercy on the souls that suffer there and so they are given respite between Pascha and Pentecost each year, and for this reason the Royal Doors remain open, the Saturday of Pentecost is dedicated to the departed, and the third kneeling prayer of Pentecost is a supplication for the departed. A pagan priest who suffered in Hell revealed to St. Macarius of Egypt in what this relief consists, saying: “When you show pity on those in Hell and pray for them, they find comfort … seeing, in a way, each others’ faces. That is the comfort.” Thus they receive, however temporary, some respite from the discord and hatred that characterizes the sufferings of Hades. Drawing on the testimony of the Fathers, the Liturgies and the Diptychs of the Church, St. Nektarios notes that for those who have reposed in communion with the Body and Blood of Christ the Church prays that God may forgive their sins and establish their souls where the just repose, but for those who have come to an evil end the Church does not supplicate for their salvation, but only that He will lighten their torments. Vassiliadis concludes the same from the Fathers. That sins may be forgiven during the intermediate state is told us by the Lord Who says in Matthew 12:32: “And whosoever speaketh a word against the Son of man, it shall be forgiven him: but whosoever speaketh against the Holy Ghost, it shall not be forgiven him, neither in this world, neither in the world to come,” which thereby implies that all other sins, however heinous, are possibly forgiven, and this is why the Church offers memorials for the departed. The Church preserves many visions and stories of souls being moved from Hades to Paradise by the mercy of God, including Colonel Andrei Feodorovich Petrov who entered bliss through the prayers and asceticism of his wife St. Ksenia of St. Petersburgh, and the Emperor Trajan who is said to have been “baptized by St. Gregory [the Dialogist’s] tears” who was moved to compassion after learning that the Emperor once ordered recompense be paid to a widow whose son had been murdered. There are various other means by which the faithful may benefit the departed: through offering charity to the poor on their behalf, the lighting of the candles and oil lamps (which constitute a kind of prayer), and the offering of alter-bread, wine and oil for the performance of the Holy Liturgy. Of course no offering is greater than the Eucharist on the behalf of the departed. However, of charity on behalf of the departed the Apostolic Constitutions teach that “These things we say concerning the pious; for as to the ungodly, if thou givest all the world to the poor, thou wilt not benefit him at all. For to whom the Deity was an enemy while he was alive, it is certain it will be so also when he is departed; for there is no unrighteousness with Him. For ‘the Lordis righteous, and has loved righteousness (Ps. 6:7).’” And here it must absolutely be noted: the Church in no way guarantees the salvation of any soul through its prayers and deeds – nothing replaces repentance in this life! Each man ought to throw himself at the mercy of God in this life and not rely on prayers offered after his repose. This would be folly. Special mention must be given to St. Mark of Ephesus, the hero of the robber Council of Ferrara-Florence in 1439 and great pillar of the Orthodox Church in whom is found perhaps the most concise and authoritative teaching on the fate of the soul after death. Drawing upon the Scriptures, Patristic homilies, Church services, Live of Saints, and visions and revelations of life after death, St. Mark ably defeated the falsities of the Latin Purgatorial doctrine put forth by Julian Cardinal Cesarini at the earlier “Union” Council of Lyons in 1270. Whereas modern “theologians” tend to distrust the lives and visions of the Saints, St. Mark shows that he is quite at home with such sources and accepts them as reliable transmissions of the Apostolic Tradition. St. Mark offered four homilies against the doctrine of Purgatory, but it is in his first Homily that is found the most concise account of the Orthodox doctrine. The Latin teaching as laid forth by Cardinal Cesarini seems to be a product of precisely that mindset which has been often warned against – of interpreting Scriptural and Patristic passages and Saintly visions too literally and legalistically. By this time the Catholic Church had come to understand Heaven and Hell as finished and unchangeable, thus the souls in them already receive the fullness of reward or punishment. Thus there is no need to pray for those in Heaven whose lot is absolute nor those in Hell who have no hope or chance of cleansing and forgiveness. However, there are the souls who repose in a middle state of imperfection but not so imperfect that they belong in the eternal punishments of Hell. These souls are assigned to Purgatory, a third place wherein they are punished by a material fire in the present time to give satisfaction for even those sins which were forgiven, and to be purified before entering Heaven. For these souls prayers and charities may be offered to lessen their time spent there. To this we say the following, and pay heed how simple and at the same time how just this is: it is generally acknowledged that the remission of sins is at the same time also a deliverance from punishment; for the one who receives remission of them at the same time is delivered from the punishment owed for them. Remission is given in three forms and at different times: (1) during Baptism; (2) after Baptism, through conversion and sorrow and make up (for sins) by good works in the present life; and (3) after death, through prayers and good deeds and thanks to whatever else the Church does for the dead … In the first and last remission of sins the grace of God has the larger part, with the cooperation of prayer, and very little is brought in by us. The middle remission, on the other hand, has little from grace, while the greater part is owing to our labor. The first remission of sins is distinguished from the last by this; that the first is a remission of all sins in an equal degree, while the last is a remission only of those sins which are not mortal and over which a person has repented in life. Thus does the Church of God think, and when entreating for the departed remission of sins and believing that it is granted them, it does not define as a law any kind of punishment with relation to them, knowing well that the Divine goodness in such matters conquers the idea of justice. Thus, although there are certain similarities in the Orthodox and Latin understandings of the afterlife, the congruence is often a matter of words alone. As St. Mark of Ephesus ably demonstrates, the Orthodox teaching has nothing to do with the overly literal and legalistic philosophy of the Latins but is rather the pure and unadulterated teaching of the Scriptures and the great Fathers of the Church, both east and west. With those who are ready for it, the teaching of the toll-houses is a powerful incentive for repentance and a life lived in the fear of God; but there are those for whom the teaching would be so frightening that I would not even speak of it to them until they were better prepared to accept it. A priest sometimes encounters dying people so little prepared for the other world that it would be pointless to speak to them even of hell, let alone the toll-houses, for fear of removing in them the little hope and awareness they might have of the Kingdom of Heaven. “Aerial Toll-Houses.” OrthodoxWiki. 29 Oct. 2011. 26 Feb. 2012. Church Monthly Newsletter: Schererville, IN (Aug. 2011). 26 Feb. 2012. All Saints Monastery. “ROCOR, Monks, Marriage and Toll Houses.” Youtube. 10 June 2011. Anonymous Monk of Whitby. The Earliest Life of Gregory the Great. Trans. Bertram Colgrave. Lawrence: University of Kansas, 1968. —– Introduction. “On the Question of the “Toll-Houses.”” By Fr. Michael Pomazansky. Christian Information Center. 26 Feb. 2012. NY: Holy Trinity Monastery, 1989. Rose. Dewdney, B.C., Canada: Synaxis Press. Bakogiannis, Archimandrite Vasilios. After Death. Trans. W. J. Lillie. Katerini: Tertios, 1995. George, CO: New Varatec Pub., 2001. Brianchaninov, Bishop Ignatius, Collected Works, vol. 3. Ed. Tuzov. St. Petersburg, 1883. (Church Life) 5-6 (Sept.-Dec. 2001). Preparers of Man’s Salvation.” Orthodox Life 28.6 (1978). for Byzantine and Modern Greek Studies, 1980. Modern Orthodox Saints, vol. 5. Constas, Nicholas. Ed. Alice-Mary Talbot. Dumbarton Oaks Papers, no. 55, 2001. 26 Feb. 2012. Elder Ephraim. Florence, AZ: St. Anthony’s Greek Orthodox Monastery, 1999.
the Evangelist John the Theologian, 1999. —— Spiritual Counsels Vol. 4: Family Life. Ed. Famellos, Anna and Eleftheria Kaimakliotis. Evergetinos vol. 1. Athens, 1981. [Greek]. Every, George. “Toll Gates on the Way.” Eastern Churches Review 8.2 (1976): 139-51. Hapgood, Isabel F., trans. Service Book of the Holy Orthodox-Catholic Apostolic Church. 4th ed. St. John of Kronstadt. Saint John of Kronstadt on Prayer – Extracts from his Writings. “Lazar (Puhalo) of Ottawa.” OrthodoxWiki. 22 June 2011. 25 Feb. 2012. Macarius, Metropolitan of Moscow, Orthodox Dogmatic Theology vol. 2. St. Petersburg, 1883. Russian Orthodox Church, 1999. Web. 19 Feb. 1999. Web. 26 Feb. 2012. Christianity Author. 26 Feb. 2012. <http://www.orthodoxchristianbooks.com/articles/ 212/a-life-archbishop-theophan-poltava/>. —– “Death and the Toll-Houses.” Vladimir Moss: Orthodox Christianity Author. 27 Nov. 2007. —–The Lenten Triodion: Supplementary Texts. South Canaan, PA: St. Tikhon’s Seminary, 2007. NY: Holy Trinity Monastery, 1996. 232-41. Orthodox Christian Information Center. —– Orthodox Dogmatic Theology: A Concise Exposition. Trans. Fr. Seraphim Rose. Platina, CA: St. Herman of Alaska Brotherhood, 1994. Puhalo, Dn. Lev. Tlingit Herald 5.6. St. Nektarios American Orthodox Church, Seattle. Robinson, Forbes. Coptic Apocryphal Gospels. Cambridge: Univ., 1896. Patrum: The Life of the Fathers. By St. Gregory of Tours. Ed. Fr. Seraphim Rose. Platina, CA: St. Herman of Alaska Brotherhood, 1988. Scott, Cathy. Seraphim Rose: The True Story and Private Letters. Salisbury, MA: Regina Orthodox, 2000. Mystic of Valaam. Ouzinkie, AK: New Valaam Monastery, 1992. St. Vladimir’s Seminary, 2002. Print. Popular Patristics. St. John Maximovitch. “Life After Death: A Homily by St. John the Wonderworker.” Footnotes by Fr.John Mack. 25 Feb. 2012. <http://orthodoxinfo.com/death/lifeafterdeath.aspx&gt;. St. Makarios of Egypt, Spiritual Homilies. Volos, 1954. St. Mark of Ephesus, First Homily on Purgatorial Fire, in Archimandrite Amvrossy Pogodin, St.
Holy Memorial Services. Athens, 1901. [Greek]. St. Symeon, Archbishop of Thessalonica, Collected Works. Thessalonica, ca. 1960. [Greek]. Dockham. Platina, CA: St. Herman of Alaska Brotherhood, 1995. 1891 (reprinted by Holy Trinity Monastery, Jordanville, NY, 1976). post. Incendiary: A Daily Living Reproach Which They Have before Their Eyes. 1 Mar. The Agpia. Sydney, Australia: Coptic Orthodox Publication and Translation, 2000. 26 Feb. 2012. The Philokalia of the Holy Neptic Fathers, vol. 1. Athens, 1957, vol. 4, 1961. [Greek]. “Toll houses?” OrthodoxChristianity.net. 23 May 2011. 26 Feb. 2012. Vassiliadis, Nikolaos P. The Mystery of Death. Trans. Fr. Peter A. Chamberas. Athens, Greece: Orthodox Brotherhood of Theologians: “The Savior”, 1993.
for Every Day of the Year. Trans. Fr. T. Timothy Tepsić. Ed. Fr. Janko Trbović. Vol. 1. Alhambra, CA: Serbian Orthodox Diocese of Western America, 2002. Clement of Alexandria, The Stromata. Origen, Hom. in Luc., 23, PG 13:1862.
of America, 1972. Fathers of the Church. St. Andrew of Crete, Homily 12: On the Dormition of the Virgin, PG 97, 1049-1052. St. Athanasius the Great, To Antiochus the Ruler, Question 32, 35:108-109. St. John Climacus, The Ladder of Divine Ascent. St. John of Damscus, Octoechos. —– On Those Who Have Fallen Alseep in Faith, 21, PG 95, 268BC. —– Philosophical Chapters 29, FC 37. St. Justin Martyr, Dialogue with Trypho. Note: Complete citations will be provided in the Works Cited section. Cathy Scott, Seraphim Rose: The True Story and Private Letters, pp. 180, 181. Fr. Seraphim Rose, A Prologue of the Orthodox Saints of the West, in Vita Patrum: The Life of the Fathers by St. Gregory of Tours, St. Herman of Alaska Brotherhood (1988), pp. 23-24. Similarly, Archimandrite (now Archbishop) Chrysostomos of the Holy Synod in Resistance writes: “So it is that many have written of late that Scripture and the Fathers of the Church are silent about the afterlife and reticent in their approach to this topic. Reticent they are, indeed, to speak of the mystical realm of Eternity in words that might make of Heaven the middle-class Protestant songfest so feared by Samuel Clemens, or cast Hell in images, not of metaphysical anguish, but of epic barbecues; but quiet about the afterlife Holy Scripture and the Fathers most certainly are not. Only our departure from Patristic study and from theology which derives from the Patristic mind can account for this great error among our contemporary theologians,” Foreword to Constantine Cavarnos’ The Future Life According to Orthodox Teaching (1985), p. 8. Quoted in Fr. Seraphim Rose, The Soul After Death (2004), p. 67. Idiomelon for the dead in the 4th tone (Octoechos), qtd. in Cavarnos, The Future Life, p. 21. The Lenten Triodion, St. Tikhon’s Seminary Press (1994), p. 144. Discourses and Sayings, Cisterna Publications (1977), pp. 185,184. The Ascetic Works, in the modern Greek version by Mark D. Sakkorrafos, Athens, 1964, p. 155, qtd. in Cavarnos, The Future Life, p. 22. St. John Climacus, The Ladder of Divine Ascent, 6:24. St. Ephraim, The Ascetic Works, p. 9, and Cavarnos and Zeldin, St. Seraphim of Sarov, in Modern Orthodox Saints V (1980), p. 47; both qtd. in Cavarnos, The Future Life, pp. 22, 23. Office at the Parting of the Soul from the Body, Canon of Prayer to the All-undefiled Birth-giver of God, on behalf of a man whose soul is departing, and who cannot speak, in Hapgood, Service Book of the Holy Orthodox-Catholic Apostolic Church (1965), p. 361. The Office at the Parting of the Soul from the Body alone contains eight references to the assault of demons upon the newly-departed soul. Additionally, from the Menaion for Sept 3rd, the Theotokion on the Praises: “Carelessly reclining in the bed of languor and heedlessness, I most slothfully pass through life; and I fear the hour of death, lest that wicked serpent, like a savage lion, in snatching up my lowly soul, rend it asunder with ruthless villainy; O blameless Theotokos, in thy goodness, hasten before the end to bestir me and raise me up to repentance and change of life,” Holy Transfiguration Monastery, p. 60. Bishop Ignatius, Collected Works, vol. III, p. 136, qtd. in Fr. Seraphim Rose, Soul After Death, p. 65. Emphasis added – to highlight that the tests of the toll-houses are not a Latin-inspired juridical affair, but rather are a means by which to determine the love, or lack thereof, for God in the soul of man. Ibid., p. 136, 133, qtd. in Fr. Seraphim Rose, Soul After Death, p. 66, 65. The Future Life, p. 24. Vlachos, Life After Death (1995), p. 62, 66, 72, 77; Cavarnos, The Future Life, p. 23. Cavarnos quotes St. Maximus the Confessor: “Those who have acquired perfect love of God and have, through their virtues, risen on the wings of the soul, will ‘be caught up in the clouds,’ as the Apostle says, and will not be brought into judgement [sic]. On the other hand, those who have not acquired love in all its perfection, but have both sins and virtues on their account, will appear before the court of judgment. There they will be tried, as it were, by fire. Their good actions will be put in the balance against the bad, and if the good outweighs the bad, they will be delivered from punishment,” Philokalia I, Athens, 1957, p. 273. Another student has taken up this task. Quoted by Fr. John Mack in St. John Maximovitch, Life After Death, at http://orthodoxinfo.com/death/lifeafterdeath.aspx. The One-Hundred Eighteenth Psalm, Interpreted by Bishop Theophan, Moscow, 1891, reprinted by Jordanville, 1976, pp. 289-290, qtd. in Fr. Seraphim Rose, Soul After Death, p. 86. St. Theophan also uses the Tale of Theodora as a preparation for confession, in The Spiritual Life and How to be Attuned to It, St. Herman of Alaska Brotherhood (1995), pp. 166-169. Collected Works vol. 3, p. 138, qtd. in Fr. Seraphim Rose, Soul After Death, p. 268. Orthodox Dogmatic Theology, vol. 2 (1883), p. 535, qtd. in Fr. Seraphim Rose, Soul After Death, p. 74. Quoted by Fr. Constantine Aliferakis in The Tropeoforos: St. George Greek Orthodox Church Monthly Newsletter: Schererville, IN, Aug. 2011, at http://content.seekandfind.com/bulletins/01/1173/20110801N.pdf. St. Barsanuphius also referred to St. Ignatius Brianchaninov’s Essay on Death which contains the toll-house teaching as “indispensable in its genre,” in Victor Afanasiev, Elder Barsanuphius of Optina, p. 736. Saint John of Kronstadt on Prayer – Extracts from his Writings. Chap. XI.118 On Prayer for the Departed, pp. 44-45, at http://classicalchristianity.com/2013/07/08/st-john-of-kronstadt-on-prayers-for-the-dead/. Prologue of Ohrid Vol. 1: January to June, Homily for June 25, p. 654. He also speaks of the toll-houses in his reflections for Sept. 22, 24, 27, Oct. 18, 24, Dec. 23, Aug. 15 and in his homilies for Nov. 7, June 25, and in the lives of Venerable Theodora of Constantinople on Dec. 30, Venerable Basil the New on March 26, and St. Taxiotis on March 28. Life After Death, at http://orthodoxinfo.com/death/lifeafterdeath.aspx. http://orthodoxwiki.org/Aerial_Toll-Houses; see post #167 at http://www.orthodoxchristianity.net/forum/index.php/topic,36319.135.html. Nun Maria Stakhovich, Sergius Bolshakoff, Interior Silence, St. Herman of Alaska Brotherhood (1992), p. 109. Vladimir Moss, A Life of Archbishop Theophan of Poltava, at http://www.orthodoxchristianbooks.com/articles/212/a-life-archbishop-theophan-poltava/. Archimandrite Ioanichie Bolan, Elder Cleopa of Sihastria, p. 152. For a full exposition of the toll-house teaching from Elder Cleopa see “The Soul’s Journey After Death,” at http://valahia.wordpress.com/2009/11/17/the-soul%E2%80%99s-journey-after-death/. Wounded by Love (2005), p. 226. In saying that he did not want to think about the toll-houses Elder Porphyrios is not denying their existence, just as he is not denying the existence of Hell, but this is consonant with his overall spirituality through which he did not seek to battle the demons but only to cling to Christ. Spiritual Counsels Volume 4: Family Life, pp. 278-279. Our Thoughts Determine Our Lives: The Life and Teachings of Elder Thaddeus of Vitovnica, p. 198. Interview conducted by Dusanka Zekovic, at http://incendiarious.wordpress.com/2010/03/01/serbian-conversations-part-1/. Our War is not Against Flesh and Blood” at http://orthodoxinfo.com/death/tollhouse_pomaz.aspx. “The Holy Righteous Abraham, Moses and Elias as Preparers of Man’s Salvation.” Orthodox Life 28.6 (Nov- Dec. 1978), p. 45. Life After Death, trans. Nicholas Stoltz, at http://www.fatheralexander.org/booklets/english/life_after_death.htm#n6. Eternal Mysteries Beyond the Grave, (1989), p. 62. Life After Death, pp. 62, 70. “’One Body in Christ’: Death and the Communion of Saints,” in Sobornost vol. 3, no. 2 (1981), p. 182. Counsels from the Holy Mountain, p. 71. See also pp. 140, 151-153, 156-157, 337, 371, 417, 436. Illumined Heart podcast on Ancient Faith Radio: “Toll Houses: After Death Reality or Heresy?”, Sept. 30, 2007, http://ancientfaith.com/podcasts/illuminedheart/toll_houses_after_death_reality_or_heresy. Mystery of Death, The Orthodox Brotherhood of Theologians: “the Savior”, Athens, Greece, (1993), p. 385. Vassiliadis is a member of this monastic brotherhood. “Lessons in Dogmatic Theology,” in ROCOR’s official publication Tserkovnaya Zhizn (Church Life), no. 5-6 (Sept.-Dec. 2001), p. 41. Bright Faith, Christ the Savior Brotherhood, p. 9. “’To Sleep, Perchance to Dream’: The Middle State of Souls in Patristic and Byzantine Literature,” Dumbarton Oaks Papers 55, at http://www.doaks.org/publications/doaks_online_publications/DOP55/DP55ch06.pdf. Death and the Toll-Houses, at http://www.orthodoxchristianbooks.com/articles/214/death-toll-houses/. Introduction to Fr. Michael Pomazanksy’s On the Question of the “Toll-Houses:” Our War is not Against Flesh and Blood, at http://orthodoxinfo.com/death/tollhouse_pomaz.aspx. Innumerable Patristic and liturgical witnesses are provided in the books cited in this paper. The Fathers, in turn, were pulling from Scriptural sources, most notablyLuke 12:20 which accurately reads: “But God said unto him, You fool, this night they demand of you your soul,” and John 14:30, already cited, in addition to those verses already cited which speak of the spirits of the air. Met. Hierotheos also cites Psalm 7:1-3, and Jer. 20:9-10. See also Zechariah chapter 3 wherein he beholds a vision of the High Priest Joshua standing before the Lord in filthy rags. Although Satan resists him, the angels of the Lord clothe the priest in new garments. See Abp. Lazar’s The Tale of Elder Basil “The New” and the Theodora Myth: Study of a Gnostic Document and a General Survey of Gnosticism and Fr. Michael Azkoul’s The Aerial Toll-House Myth: The Neo-Gnosticism of Fr Seraphim Rose. Fr. Seraphim Rose, Soul After Death, p. 75. Life After Death, p. 77-78. Hom. in Luc., 23 (PG 13:1862). Soul After Death, p. 185. The Future Life, p. 26. Abp. Lazar Puhalo writes: “We need not even go into detail and offer comparison with the horror-filled Scholastic, Latinized doctrines of aerial purgatories, toll-houses and demonic tribunals,” in The Commemoration of the Dead, Synaxis Press, p. 21. Met. Kallistos Ware, ‘One Body in Christ,’ p. 184. Fr. Seraphim writes: “There is no paganism, no occultism, no ‘oriental astrology,’ no ‘purgatory’ whatever to be found in the Orthodox accounts of the toll-houses,” in Soul After Death, p. 243. Concerning Fake Patristic Texts Used by the Toll-House Cult, at http://new-ostrog.org/discussion-on-the-toll-houses. See also Abp. Lazar, The Tale of Elder Basil “The New,” pp. 73-78. Fr. Seraphim Rose, Soul After Death, p. 74. Archbishop Lazar: “This is the first selected aspect of Gnostic dualism that concerns us here. In a somewhat modified form, it is a necessary element of the aerial toll-house myth, which makes Satan equal with God in the realm of the judgment of the soul,” The Tale of Elder Basil “The New,” pp. 4-5. Life After Death, p. 79. The Stromata 4.18, although he is not clearly referring to the soul’s after death ascent. Quoted in Vassiliadis, The Mystery of Death, p. 390. Fr. Seraphim Rose, Soul After Death, pp. 72, 76, 77. From the Coptic prayer book The Agpia, at http://www.saint-mary.net/books/agpia/Agpia.pdf. Coptic and Apocryphal Gospels, ed. and trans. Forbes Robinson (Cambridge, 1896), pp. 95-99, qtd. in George Every, “Toll Gates on the Way,” Eastern Churches Review vol 8, no. 2, 1976, p. 141. Quoted in Fr. Seraphim Rose, Soul After Death, p. 73. Lenten Triodion Supplement, p. 58. Many other references to the Toll-Houses and the terror of demons at death can be found throughout the Octoechos, Menaion, Triodion, Pentecostarion, and the Office at the Parting of the Soul from the Body, the Canon to the Guardian Angel, The Order at the Parting of The Soul from the Body When One Has Suffered For a Long Time, Another, Similar Prayer for the Assault of Lust in the Book of Needs vol. 3, the funeral services for priests and for laymen, numerous Akathists, and many other prayers and hymns of the Church. Tlingit Herald, St. Nektarios American Orthodox Church, Seattle, vol. 5, no. 6:3-9, p. 19, qtd. in Fr. Seraphim Rose, Soul After Death, p. 237. “Death as a Good,” in Seven Exegetical Works (Fathers of the Church Series vol. 65), 4:15, p. 80, qtd. in Fr. Seraphim Rose, Soul After Death, p. 177. First Conference, chapter 14, in the Works of St. John Cassian the Roman, Russian tr. by Bishop Peter, Moscow, 1892, pp. 178-179, qtd. in Fr. Seraphim Rose, Soul After Death, p. 178. This revelation is summarized in Archbishop Lazar’s The Tale of Elder Basil ‘The New,’ pp. 74-76. Soul After Death, p. 187. Evergetinos 1, p. 161, qtd. in Cavarnos, The Future Life, p. 30. The Future Life, pp. 34-35. Collected Works vol. 3, pp. 309, qtd. in Fr. Seraphim Rose, Soul After Death, p. 130. Soul After Death, p. 130-131. The Mystery of Death, p. 399. Life After Death, p. 90. Philosophical Chapters 29, FC 37, p. 54, qtd. in Vlachos, Life After Death, pp. 84-85. Life After Death, pp. 85-86. On the Soul and Resurrection chap. 5, p. 65-69, SVS, qtd. in Vlachos, Life After Death, p. 86. Life After Death, p. 265. The Ascetical Homilies, Holy Transfiguration Monastery, Boston, Homily 28, p. 141. Homily 12: On the Dormition of the Virgin, PG 97, 1049-1052. Spiritual Homilies, Homily 40, qtd. in Cavarnos, The Future Life, p. 33. Philokalia vol. 4, Athens, 1961, pp. 36-38. The Ascetic Works, modern Greek version by Mark D. Sakkorrafos, Athens, 1964, p. 279, qtd. in Cavarnos, The Future Life, pp. 33-34. Collected Works [in Greek], Athens, c. 1960, pp. 346-347. Bakogiannis, After Death, p. 69. Quoted in Ibid., p. 79. St. Macarius of Egypt, Spiritual Homilies, p. 233; St. Athanasius, Library of the Greek Fathers and Ecclesiastical Authors, 33, p. 195. To Antiochus the Ruler, Question 32, 35:108-109. On Those Who Have Fallen Alseep in Faith, 21, PG 95, 268BC. In Nun Maria Stakhovich, Sergius Bolshakoff, Interior Silence, p. 176. On Those Who Have Fallen Asleep in Faith 21. Soul After Death, p. 253. Qtd. in Bakogiannis, After Death, p. 90. The Mystery of Death, p. 430. Study Concerning the Immortality of the Soul and Holy Memorial Services, Athens, 1901, pp. 83-85. Mystery of Death, p. 434. The Earliest Life of St. Gregory the Great, by an anonymous Monk of Whitby, tr. by Bertram Colgrave, Univ. of Kansas Press, Lawrence, Kansas, 1968, pp. 127-129, referenced in Fr. Seraphim Rose, Soul After Death, pp. 203-204n. Fr. Seraphim Rose offers a succinct summary of the Latin teaching in The Soul After Death, pp. 197-198. First Homily: Refutation of the Latin Chapters Concerning Purgatorial Fire, qtd. in Fr. Seraphim Rose, Soul After Death, pp. 209-210. Life After Death, pp. 70. Soul After Death, pp. 234-235.
i will definitely check out the quotes you have compiled, thank you very much! What a well written and decisively patristic paper. I personally feel energized and emboldened to truly make a new beginning of Christian life after reading it. I hope your professor graded you well on it. It’s so important for Orthodox people to understand the Church’s teaching on this so important subject. I would really appreciate a pdf version of your paper, if possible. Thank God if it was able to help at all …. but as you can see I really did little other than quote the true authorities! Thank God for such people. I’m been having problems with updating Adobe so I don’t think I can make it into a PDF but I can email you the paper from Word and you’re welcome to make it into one if you know how. Just . . . . . . . Excellent. Clear, concise for such a huge topic, and well-documented. Many years to you, bro. So instead of outlining the views of 34 saints, holy elders, and theologians, why did you not outline a few of the “innumerable” fathers on the topics? Plus, I would challenge your use of St. John of Kronstadt, as your reference is hearsay and is not cited in his writings. You have them in your “works cited”, but not referenced in the text. Secondly, I think you should explore not the existence, but the composition and nature of the trials and terrors awaiting the soul. Should the average Christian be “terrified” of the terrors to come? How can they be mitigated? How does our life in the creation affect this terror to come? Finally, toward the middle you make a startling statement – quoting someone else – that the soul after separation from the body no longer has free will. Does this strip the soul of personhood and recognition by God? How important is free will in the existence of persons? Thanks for your comments – they are all good. I had originally intended to look more in depth at the Patristic accounts of the toll-houses, but it basically came down to space — the paper was already too long as is, and I knew that Dn. Milan was covering that in his paper which is exclusively on the toll-houses. As for your questions about free will …. i dont think this strips the soul of its personhood or recognition by God for it is in that state that God is more easily able to have mercy on the soul, according to Bakogiannis at least. I don’t think free will is literally lost, but its not able to be acted out, but Bakogiannis’ writing is not 100% clear on this if i remember correctly, but this is the harmony I arrived at when doing my research. As for St. John of Kronstadt, you are correct that its officially hearsay I guess, although I guess I just consider Elder Ephraim and St. Anthony’s a reliable enough witness (although of course many do not). Although Fr. Serahpim also lists him as teaching the toll-houses, I could have added that. But anyways, thanks again — good comments and questions. Is there any way possible that I can read Dn. Milan’s paper on the tollhouses? I’m going to email him, too, if that’s ok. I think there’s a balance with those who genuinely follow the patristic royal path. It’s not a gloomy thing, and it never loses love for those who may be in error on a particular point. It’s also zealous for unity whenever and wherever that can be achieved without compromising the truth. Great example: Patriarch St. Photios the Great and his unity with the Roman Patriarch. He knew that the Roman Church was not healthy– that in fact it was violating the canons much more than any other local church. Their ordination practices, their fasting, even in some places their Eucharistic practices. None of this to mention the still exaggerated claims of the Roman Church at the time. And yet he knew that the one thing needful was to worship the true God– as expressed in the unaltered Creed of the Church. The other things could be changed with repentance. I try to remember that when I see certain less-than-ideal things in American Orthodoxy. We have to remember that our epoch is the lowest spiritually, the weakest feeblest Orthodoxy there ever has been, and in many things we have to be indulgent. However, we cannot be indulgent with ourselves, lest we perish eternally. We have to work to rekindle the fire of holy zeal in the American Church. We have to pass along the true patristic teachings on things like this, and upon spiritual practices of the holy fathers that we can and should do here. Thank God, we have people like Elder Ephraim and other holy monks, although not nearly as many as we would have were our Orthodoxy spiritually healthy, spiritually sober. I’m really grateful to find any traditional Orthodox who understand that Orthodoxy is first and foremost the salvation of the soul. I’ll right away take hold of your rss as I can not to find your email subscription hyperlink or e-newsletter service. Do you’ve any? sorry i dont have a subscription or newsletter service. Hi there! I simply would like to offer you a big thumbs up for the great information you have right here on this post.